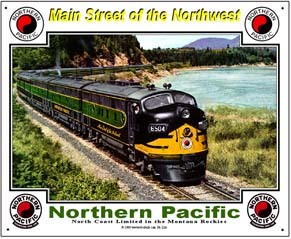 The Northern Pacific Railroad was the Mainline of the Northwest. Now part of the vast BNSF system. Individual marks are licensed marks owned by BNSF Railway Company and are used under an active license agreement. 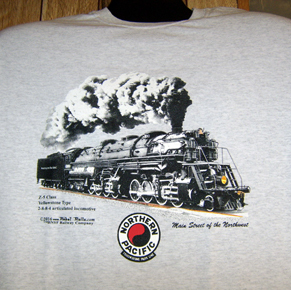 The largest steam locomotive when built, this Northern Pacific 2-8-8-4 articulated Z-5 class steam locomotive is a stunning addition to our growing "great steam" t-shirts that any NP fan will love to have. 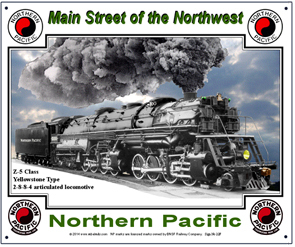 The unique and historic yin yang logo of the Northern Pacific Railroad is featured on this coffee mug, with the color scheme of NP diesels as the background and their Main Street of the Northwest script. 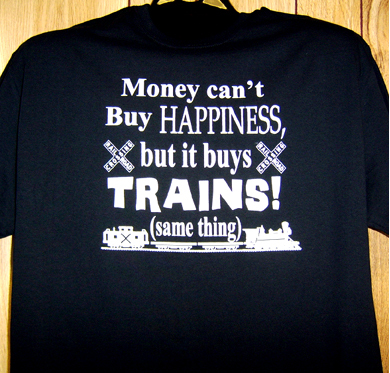 Now a major part of the BNSF Railway system. Coffee Mug featuring the Northern Pacific Railroads famous Z-5 class 2-8-8-4 articulated steam locomotive. The largest steamer in the world when built. Northern Pacific Railroads famous Z-5 class, Yellowstone type, 2-8-8-4 articulated steam locomoitve, the largest in the world when constructed. 6 inch x 6 inch square tin sign of a dual tag line logo used by the Northern Pacific Railroad in the 1920's and '30's. 6 inch x 6 inch square tin dual logo sign of Northern Pacific Railroad. 6 inch x 6 inch square tin logo sign of the Northern Pacific Railroad. 6 inch x 6 inch square tin logo drumhead used by the Northern Pacific Railroad on its Northcoast Limited passenger train. 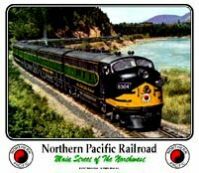 6 inch x 6 inch square tin logo and images sign of the Northern Pacific Railroads North Coast Ltd. passenger train. 6 inch x 6 inch square tin old logo used by the Northern Pacific Railroad in the late 1800s. 6 inch x 6 inch square tin Yellowstone logo used by the Northern Pacific Railroad. In 1893 NP adopted the ancient Yin and Yang Monad symbol of eternal life for their logo. 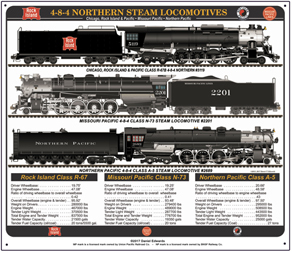 A study in 4-8-4 steam locomotives, featuring a MoPac; NP and Rock Island railroads. 4-8-4 wheel arrangements were utilized on just about every American Railroad. 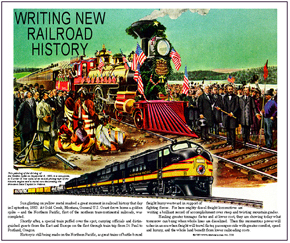 Special tin sign of the driving of the golden spike on the Northern Pacific Railroad, the Mainline of the Northwest. The Northern Pacific Railways Companys transcontinental North Coast Limited is rolling through the Montana Rockies in this scene never to be witnessed again. 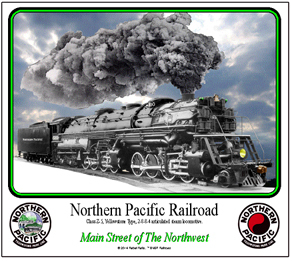 Tin sign features the famous Z5 Class articulated steam locomotive used by the Northern Pacific Railroad.